Last April, Rocky Mountain College enacted a new tobacco policy for its campus. 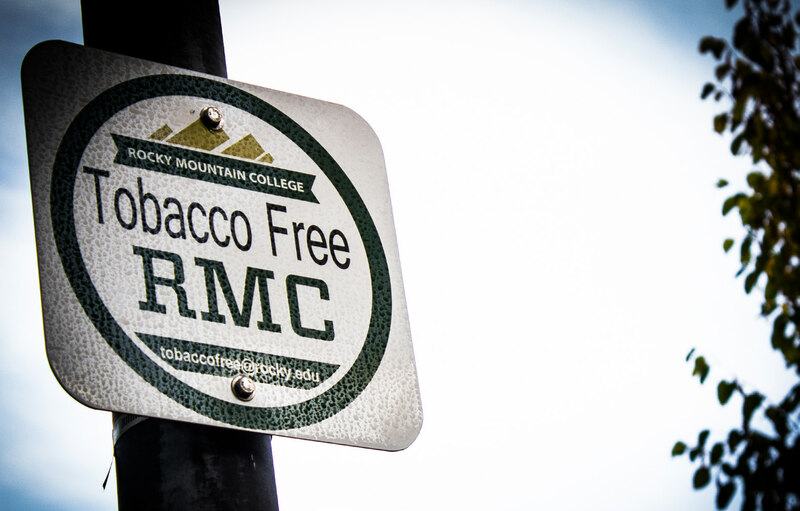 Decals are now posted on campus buildings signifying RMC’s status as a tobacco-free zone. However, the policy has not escaped some criticism pertaining to how it was established and its specific details. According to Jack Jennaway, the current President of the Associated Students of Rocky Mountain College(ASRMC), Rocky operates underneath the model of “shared governance.” Through this model, there are three main constituencies that can present their case before the board of trustees. These groups include the faculty, the staff, and ASRMC. ASRMC functions specifically as the voice of the students. The three parties present their viewpoints, however the board of trustees has the final say on what becomes law and what does not. In the case of the new tobacco-free policy, Zach Pietrocarlo, last year’s ASRMC president, went before the board and pre-ented a report on student concerns and ASRMC’s resulting vote. This was after ASRMC conducted surveys, gaged student responses, and considered the policy in detail. Jennaway, an ASRMC senator at the time, conducted a survey of the residents of Rimview Hall and received a resounding no. He explained there was a sense among students that there was no inherent problem with the former policy, which allowed use of tobacco products as long as it was a minimum of 50 feet away from buildings. Students were also skeptical as to the real motive behind the new policy, some students going as far to suggest that the decision to go tobacco-free had more to do with “marketing” for RMC. The ASRMC vote was against the new tobacco-free policy, with two abstaining, and zero members in favor of the policy. According to Brad Nason, vice president of student life, despite ASRMC’s rejection of the proposal it was supported by both the faculty and the associated staff. The board, after careful consideration, decided to go through with the policy as it was written. Under the current policy, the “use, sale, or distribution of tobacco products is prohibited on all properties owned, operated, or leased by Rocky Mountain College.” In addition to the banning of traditional cigarettes and oral tobacco, electronic cigarettes and vaporizers are also forbidden. Products such as vaporizers that contain no tobacco are not allowed because “there just isn’t enough information about the health impacts of vaping…We just felt like it was splitting hairs and we didn’t want to muddy the water there,” said Nason. While it is noted that RMC is committed to providing a healthier environment for its students, there were other factors that influenced the decision to go forward with the policy. One factor is that Rocky was the last four-year college in the state of Montana to adopt a tobacco-free campus. As Nason puts it, “You don’t want to be the only four-year institution in the state that has not adopted a tobacco-free position.There are some lists you just don’t want to be on.” Another factor was the concern about property damage. There were reports of library books being ruined by students not adequately disposing of their chewing tobacco. According to the policy, students who are not compliant will face “disciplinary action implemented through the Student Code of Conduct process.” This means they meet with the Dean of Students, then if they are still found in violation of the policy further disciplinary action is taken.